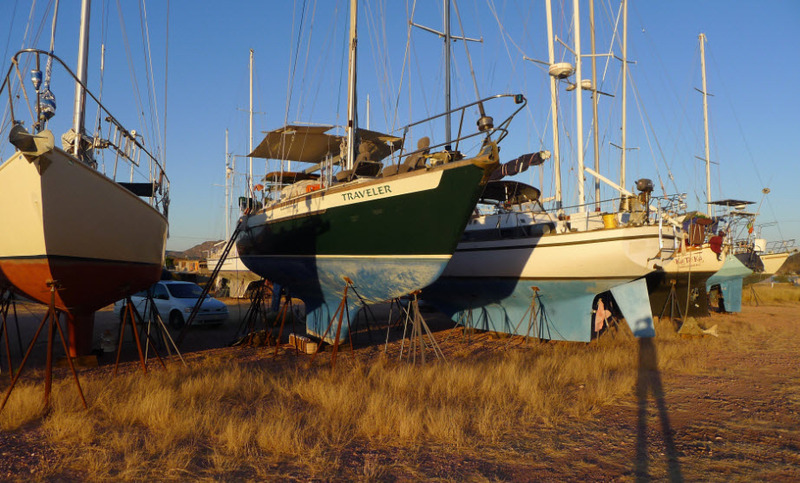 Being back in the Guaymas boatyard is like being back home. We rolled in at sunset, finding our friends Desiree and Damon (S/V Gaia) sitting under their boat, holding court with a bottle of tequila. Desiree ran to our car and gave us hugs through the window. "Come over and tell us where you've been!" We took more than a week driving from Olympia to Guaymas. On the Oregon coast we found Heather on couchsurfing.com and enjoyed a nice evening with her and Gail. In northern California we took a hotel room for the night then rushed down to Culver City near Santa Monica to Naida's house. 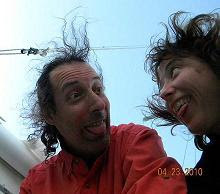 Naida and Marco (S/V Linda Rae) have a house a few miles from the marina and we stayed there for four nights catching our breath and getting all the measurements we needed to order a new forestay and roller furler. 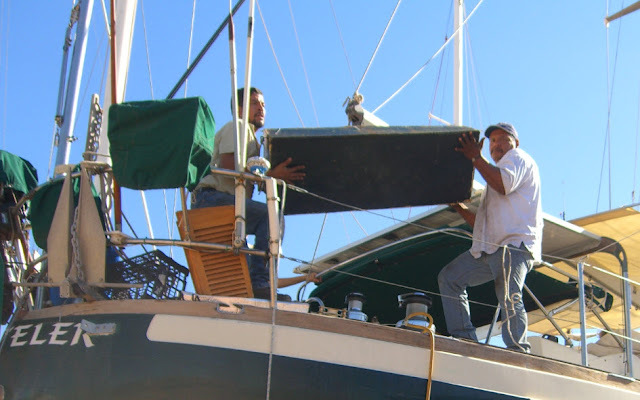 Andrew, the yard manager down at Marina Guaymas Seca, climbed aboard our boat and measured things on the foredeck and sent them to us via email. We then talked to Ed at Downwind Marine in San Diego and he said, "Come get your furler." In San Diego we visited Ed and bought cabling and furler parts then visited with our friends Hal and Nina (S/V Luna Sea). We stayed at the famous Vagabond Inn there in Shelter Island. After speed shopping for all those items we cannot find in Mexico we high tailed it across the southern California hill country and the Arizona desert and found a Motel 6 just north of Tucson. We drove across the Nogales border crossing and got the red light at the Mexico customs station. I think we got flagged because of the weight of the car. 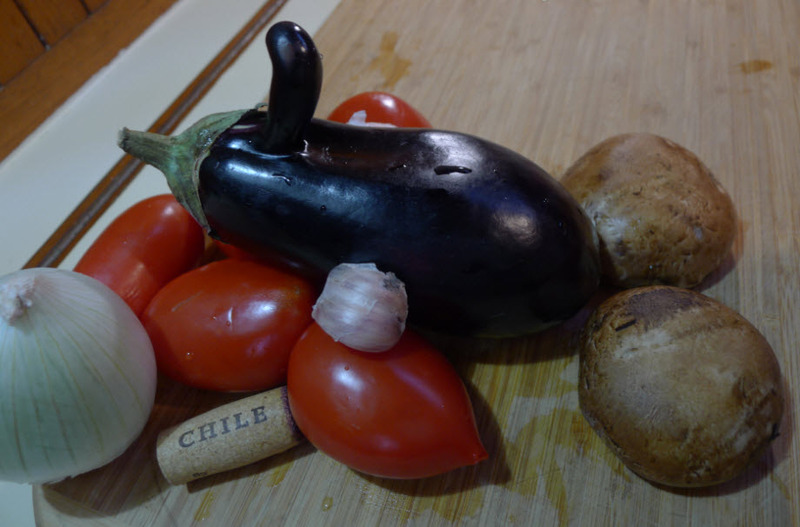 The customs agent poked around our belongings in a desultory manner until we volunteered to show her our wine. This she examined with gusto, checking the volumes and making certain we were under our limit. The five thousand dollars' worth of boat parts we were carrying remained undisturbed with no duty paid. With a sigh of relief we left the crossing and wove our way to the Immigration office at KM 21 where we picked up our six month's visas. Heading south towards Hermosillo, Connie and I whooped and hollered. Home at last! The first night we slept in the car. Day two we unpacked a few things, cleaned up the galley, and prepared our cabin so we could have a clean place to sleep. Now, a week later, we are in the work groove, cleaning the dust and grit outside and inside the boat, stowing our gear and provisions, and starting in on the big to-do list. Even though we've got loads of things to get done, we are taking our time, enjoying hot tea in bed in the morning, and knocking off to watch the sun set each night. I can't tell you how happy we are to be back home at the boat. It is where we should be all year long. Being a boat, Traveler has a little evil streak that I'm sure you have noticed. This time she pulled a little stunt by completely discharging all three of the main batteries. Even though they were disconnected all summer, every one of them registered below 12.2 volts..... meaning, they were damaged if not dead. One registered 7 volts, one 12.1 volts, and one 12.2 volts. I cranked up the charger hoping for a miracle but after two days I gave it up and found a Bob in San Carlos who brought me two new 8Ds, and one Group 27 battery. It cost an arm and a leg and would have cost my first born child if I had one. We got delivery and hoisted those fat boys aboard. So as not to feel too bad about the unplanned expense, my plan is to sell the Oldsmobile van to pay for the batteries. Then I started in on the first big project, replacing the two black iron diesel tanks. (As you remember, last April when we tried to cross to Hawaii, one of the tanks developed a crack and we had to turn back.) I took everything out of the two cockpit lockers and the rear lazarette and disassembled the wood partitioning walls inside. Then I removed all the vents and fuel connections to the two tanks. The tanks were lightly tabbed with fiberglass to the hull so I used a chisel to break through the material on both sides. After removing the rusted connecting bolts the two tanks were free. Tank halfway out. It just fits thru the access door. I took the main halyard and ran it through a turning block at the end of the boom and down through the starboard cockpit locker, tied it to the starboard tank,and hoisted it up six inches out of the way. 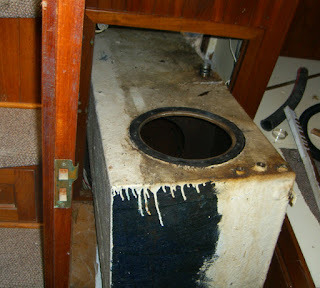 Then I was able to lever the port side tank to line up with the access door in our main cabin. Rigging a lift line and a handle I pulled upward and was barely able to budge the tank. Clearly what was needed now was some real manpower, younger and stronger than me. I called Omar. You remember Omar. He's the gentleman who became part of our family last year as we spent three months together trying to get our new engine installed. Omar said he'd be right over. "Right over" means later the next day when Omar showed up with his brother Arturo. The two of them heaved and shoved but the tank seemed to be stuck. 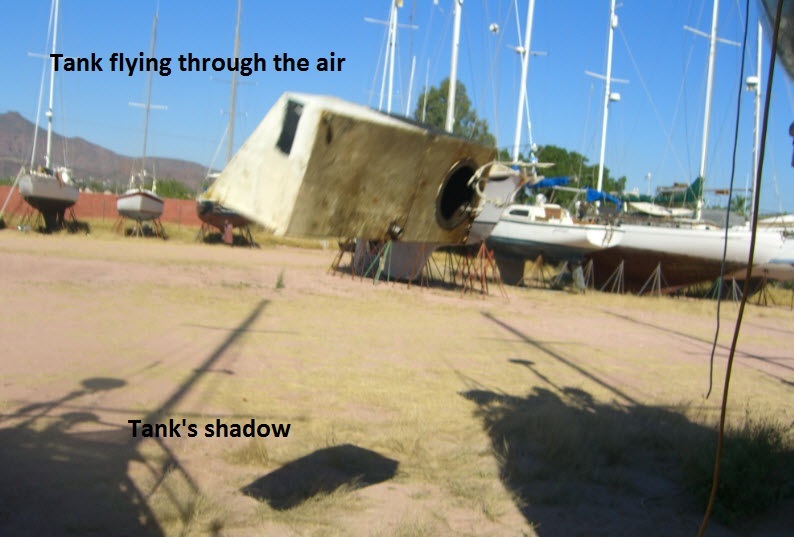 Connie got down in the port side locker, braced herself against the hull, and gave the tank a mighty shove. It popped over a few inches allowing the men to lift the heavy iron tank up and out of the deep bilge, into the aft stateroom, up the stairs, and into the cockpit. When I suggested we rig a hoist to lower it to the ground, Omar said, "No. We'll just throw it over the rail. It will feel good!" Omar and Arturo tossing a tank. 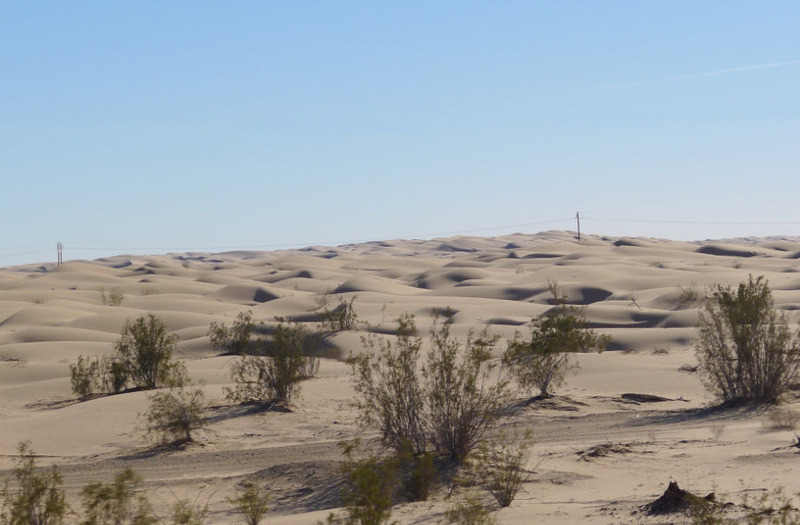 So Omar and Arturo heaved it over the lifelines and tossed it overboard where it crashed to the ground in a puff of dirt and dust. Big grins all around. Everyone in the yard turned their heads. Applause broke out. Then the brothers muscled out the second tank and tossed it overboard as well. Albert, the local HDPE, PP & ABS welder came to the yard, measured the tanks, and is now building me new plastic ones in his San Carlos shop. Meanwhile I'm cleaning the cavernous bilge and getting my ducks in a row to install new tanks, hoses, valves, and fuel/water separators. On our checklist is exercising the thru hull valves. We try to do this every month while on the boat. Of thirteen, one was frozen, its handle twisting off when we tried to force it open. Oh joy of joys! 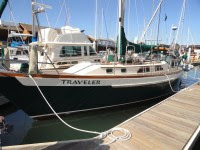 Even with a somewhat daunting looking task list ahead of us, we are still very happy to be back on our dear Traveler. Late in the day when I walk through the yard and the guys sitting under a nearby boat holler over at me, I change course and join them for a beer or two. We sit in the shade, a motley group of grey haired men, telling sailing stories, and discussing the various repairs we are immersed in. If I listen closely I can just make out the distant sound of singing and playing as Connie down below on Traveler is composing a new song. A good life it is.